Posted on November 16, 2011, in SQL Server, T-SQL and tagged DBCC, LOOPBACK, OPENQUERY, SQL, SQL Server, T-SQL, TABLERESULTS. Bookmark the permalink. 9 Comments. This could not have come at a better time. I am rewriting all of my maintenance scripts and I had difficulty determining the table structure for DBCC CHECKDB output. I am now able to cross-reference what I have built with the help of this post. Thanks for posting, job well done! 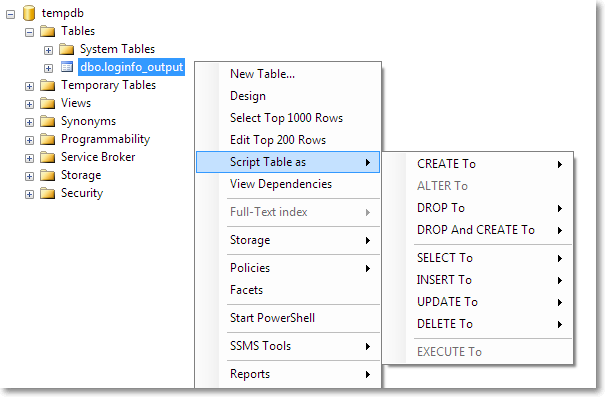 Unfortunately, the incredible “feature enhancements” of SQL Server 2012 blow this good method out of the water. The metadata could not be determined because statement ‘DBCC LOGINFO();’ in procedure ‘loginfo’ does not support metadata discovery.